Balancing now worked... However i couldn't remove the device anymore and rebooted. When the phone boots i get filesystem recovery which fails. 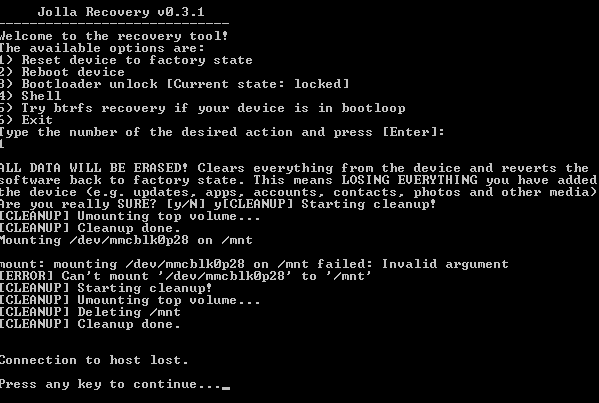 Using the recovery mode -> factory reset ->fails too mmcblk0p28 can only be mounted 'dirty' , so thats why it fails. Trying to check why it can only be mounted dirty --> BRTFS shows the following output: The missing device must be the /dev/loop0 How can i remove it? I'm sorry for you, Btrfs is not ready for mainstream! It's just a geek toy! Im one of the early adopters and now i have to say, after 4 + years: Its for geeks that want a toy, not for geeks that want a phone. Similar problem here. Luckily I have not yet fucked up the phone completely with btrfs. But anyhow, OS update will not run because it clogged up all the space and I cannot delete files because the disk is full?!? Funny how a company can release so buggy SW and SW updates that when normally using the device it basically breaks the product. And I am now talking about the OS update. User shouldn't even need to consider using btrfs or recovery mode. And because the phone is out of warranty the reipair costs would go to me? Oh well... Maybe I go and get myself a Samsung as all the rest of the peons. I ordered a Sony Xperia for 1 Euro (existing contract). Not going to spend one more minute into fixing this mess of a OS. I´m very sorry. Thats not good. Seems to be that the balancer was runing in background after finished and not released the loop0. So it wasn´t able to unmount and the reboot smashed the btrfs because the sdcard was initialated at a later point. Only chance to bring it back to life is to send in to service for reflash the image. Or reflash it by your own, the howto could be found at the TMO Forum (the unsupported way). Pls contact Jolla service to send in your device, they will help you. I shall try to re-flash it on my own, otherwise i have a good idea what to do with it (it involves high velocities). Not going to spend a fortune on the repair of a 4.5 year old phone tbh, as much as i like Jolla. Could you provide a link for the reflashing part please? I´m realy sorry but on copyright issues it is not allowed to provide the data here. Please try to google at talk.maemo.org to get the needed information. For me it´s to tricky. You could break your device forever. Try to send in at Jolla Care, they will help you! Wow Jolla is so community friendly and open source.. /sarcasm off It was the reason i bought a Jolla Phone, thinking they would open source everything as they have said. They will, if it´s possible.Qualcomm is the reason of thirdparty copyright issue not Jolla. You can tell Qualcomm to open it´s drivers and then it would. @ozzi776 weiß man immer erst nachher und was wären die Alternativen gewesen? Schick es über Jolla Care, eines meiner Geräte wird auch gerade geflasht. So genug auf Deutsch, back to english. @evo3de I don't know what the alternatives are, but my point is opensourcing all the apps should have been done right at the beginning. Then i could have wrote the freaking calendar backup function on my own, now i have a huge blob of data i cannot use anywhere else. Blah blah opensource community .